The term ‘off-grid’ refers to not being connected to a grid, meaning the connection to the local electrical grid. Increasingly, it’s a popular choice for people who want to reduce their carbon footprint and gain energy independence or are so far removed from the grid that connection costs are prohibitive. Whereas a typical home or business is connected to grid power, an off-grid system user generates electricity with solar panels to supply their energy needs. Some people prefer to produce their own renewable energy, while retaining the option to rely on the grid, in other words, to remain ‘grid-tied.’ Some people prefer the convenience of relying upon city water and sewage services, while others prefer to live completely off-grid by adding wells or cistern system, and a septic system. Off-grid solar systems are completely independent energy producing systems. They are not connected to the power grid at all. These systems are designed to generate extra power when the sun is out and store it in a battery bank. When there isn’t enough sunshine or at night, your home or business draws power from the battery bank. You can read about our off-grid customers experience on our blog in the May and November archives. 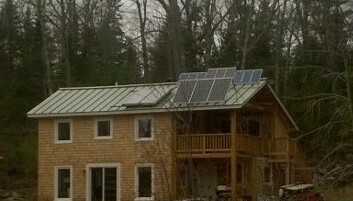 This off-grid electric system is comprised of PV panels, an inverter, charge controller and six Rolls Surette batteries and a solar hot water system, backed up by a wood stove. Our customer milled the wood for his home, which also utilizes geothermal principles. Off-grid solar systems may have extra capacity or include a second power source, such as a generator or wind turbine to charge the battery bank if there are clouds for several days in a row. The off-grid solar power system can also be integrated with your home’s existing power supply. For instance, it’s possible to run your computers and lighting from your off-grid solar system, while the rest of your home’s appliances are connected to the utility grid. In this case, if the utility’s power goes out, you can still maintain your computers and lighting even though other appliances are down. It’s possible to reduce your energy use without sacrificing your lifestyle. After an adjustment period, our customers learn to be conscious of energy-use habits and easily adapt to the limits of their solar system. Remembering to turn out the lights and using the washer at a low energy-use time period can make a big difference. For customers requiring additional energy, it is easy to adjust energy systems by adding more solar panels. Sundog Solar can help you estimate your energy needs. Use this load estimator to estimate your average amp hours per day based on the appliances you use. Sundog Solar can help you determine an approach to combining renewable energy components to create a system that suits your lifestyle and your energy needs. What will I need to go off-grid? 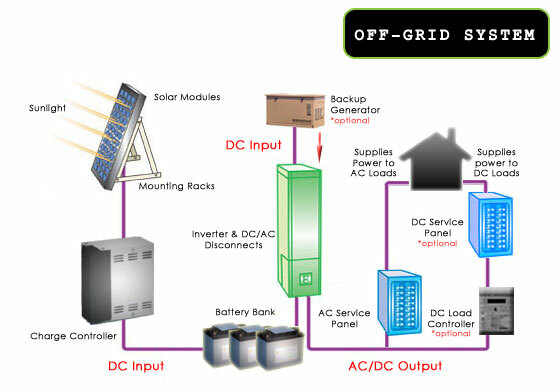 Primary off-grid solar energy components include Solar Modules, Batteries, a Charge Controller and an Inverter Charger. These components are combined to create a power center for your home. Talk with our off-grid specialists at Sundog Solar about the latest off-grid solar power products.